You undertake that all details you provide for the purpose of ordering or purchasing goods are correct, that the credit or debit card or Paypal account you are using is registered to the billing address provided. Each item purchased is sold subject to its Product Description. We take all reasonable care to ensure that all details, descriptions, measurements and prices of products appearing on the website are correct at the time of publishing the website. 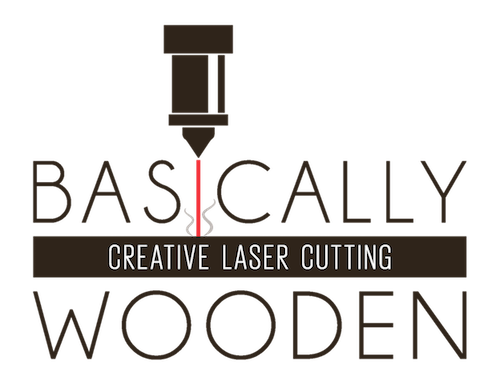 All our products are individually lasercut from wood, then assembled and finished by hand. Some variations in the colour of the wood available at the time of manufacture will occur - if you have any preferences for colour, please get in touch and we will do our best to fulfil your request. Also note that the colour of products will vary slightly from the images on the website due to different screen display settings. Basically Wooden is VAT registered. Ordering from Basically Wooden Is simple. Browse through our products and add your selection to the shopping basket. Once you have finished shopping, select Checkout from the Shopping Basket section, this will allow you to complete your transaction. Our purchasing platform is securely hosted by Mals E-Commerce and you will be directed to PayPal where you can either use your PayPal account or checkout as a guest - you do not need to be a PayPal account holder and can use either a debit or credit card of your choice. After placing your order, you will receive an email confirmation with details of the items ordered. Unfortunately, we cannot offer refunds on personalised / customised items.